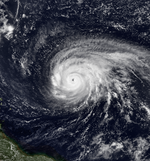 The 1999 Atlantic hurricane season had five Category 4 hurricanes – the highest number recorded in a single season in the Atlantic basin, later tied in 2005. The season officially began on June 1, and ended on November 30. These dates conventionally delimit the period of each year when most tropical cyclones form in the Atlantic basin. It was a fairly active season, mostly due to a persistent La Niña that developed in the latter half of 1998. The first storm, Arlene, formed on June 11 to the southeast of Bermuda. It meandered slowly for a week and caused no impact on land. Other tropical cyclones that did not affect land were Hurricane Cindy, Tropical Storm Emily, and Tropical Depression Twelve. Localized or otherwise minor damage occurred from Hurricanes Bret, Gert, and Jose, Tropical Storms Harvey and Katrina. The most significant storm of the season was Hurricane Floyd, a strong Category 4 hurricane that caused devastating flooding along the East Coast of the United States, especially in North Carolina. Damage from the storm totaled approximately $6.5 billion (1999 USD)[nb 1] and there were at least 77 fatalities, making it the deadliest hurricane in the United States since Hurricane Agnes in 1972. Flooding from Floyd in North Carolina followed Hurricane Dennis, a slow and erratic–moving storm that dropped heavy rainfall in the eastern portion of the state. Tropical Depression Eleven in October contributed to extreme flooding in Mexico, which left 636 people dead and caused $491.3 million in damage, though impact could not be distinguished from the storm itself. Hurricane Irene caused extensive flooding in Cuba and Florida, with lesser effects in the Bahamas and North Carolina. Irene was the second–costliest storm of the season, with about $800 million in damage. Hurricane Lenny was an unusual eastward–moving storm in the Caribbean Sea and a strong late–season storm. It caused extensive damage in the Lesser Antilles in the month of November. Collectively, the storms of the 1999 Atlantic hurricane season caused at least 123 fatalities and $8.19 billion in losses. Ahead of and during each hurricane season, various national meteorological services, scientific agencies, and noted hurricane experts issue forecasts of hurricane activity. These include forecasters from the United States National Oceanic and Atmospheric Administration (NOAA)'s National Hurricane and Climate Prediction Center's, William M. Gray and his associates at Colorado State University (CSU), as well as Weather Research Center (WRC) and Tropical Storm Risk (TSR), then known as TSUNAMI. The forecasts include weekly or monthly assessments of the significant factors that help determine the number of tropical storms, hurricanes, and major hurricanes within a particular year. Gray and his team at CSU issued their initial season outlook on December 4, 1998, predicting fourteen named storms, nine hurricanes, and four major hurricanes. The three main factors for this above average season forecast cited included a continuation of abnormally warm sea surface temperatures, the probability that La Niña conditions would remain, and that the Quasi-Biennial Oscillation (QBO) winds would be in a westerly phase. Early in 1999, WRC issued its forecast for the season, projecting ten named storms and six hurricanes, but no prediction on the number of major hurricanes. In subsequent outlooks from Gray and his associates in April, June, and August, the predictions were unchanged. On April 7, CSU noted that the probability of a major hurricane landfall in the United States was 72%, including a 54% chance on the East Coast and a 40% likelihood on the Gulf Coast. In their outlook on May 27, experts at NOAA noted that an above average season was a strong possibility. An addition to a La Niña, vertical wind shear would be decreased across much of the Caribbean Sea and tropical Atlantic Ocean, and a favorable jet pattern for tropical waves to develop into tropical cyclones. On June 1, TSR predicted that there would be 12 named storms, 7 hurricanes, and 2 major hurricanes. 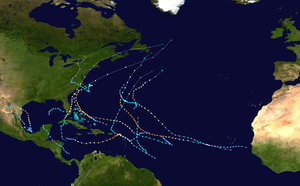 As stated by NOAA and CSU, an average Atlantic hurricane season between 1981–2010 contains roughly 12 tropical storms, 6 hurricanes, 3 major hurricanes, and an Accumulated Cyclone Energy (ACE) Index of 66–103 units. NOAA typically categorizes a season as either above-average, average, of below-average based on the cumulative ACE Index; however, the number of tropical storms, hurricanes, and major hurricanes within a hurricane season is considered occasionally as well. The Atlantic hurricane season officially began on June 1, 1999, and the first tropical cyclone developed on June 11. It was an above–average season in which 16 tropical cyclones formed. Twelve depressions attained tropical storm status, and eight of these became hurricanes. Five hurricanes intensified further into major hurricanes. 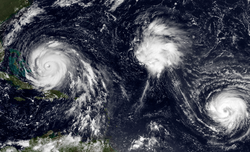 The season featured a record-breaking five Category 4 hurricanes, later tied in 2005. These were Bret, Cindy, Floyd, Gert, and Hurricane Lenny. The last storm of the season, Hurricane Lenny, dissipated on November 23, which was about a week before the official season ending on November 30, 1999. A persistent La Niña that developed during the previous season was attributed to the above average activity. Between August and October, there was very low wind shear over the Caribbean Sea and western Atlantic Ocean, attributed to a combination of abnormal upper-level easterly winds and low-level westerly winds. Six hurricanes and two tropical storms made landfall during the season and caused at least 123 deaths and approximately $8.19 billion in damage. Hurricane Gert also caused damage and fatalities, despite not making landfall. Overall, the season's activity was reflected with a high cumulative accumulated cyclone energy (ACE) rating of 177. ACE is, broadly speaking, a measure of the power of the hurricane multiplied by the length of time it existed, so storms that last a long time, as well as particularly strong hurricanes, have high ACEs. It is only calculated for full advisories on tropical systems at or exceeding 34 knots (39 mph, 63 km/h) or tropical storm strength. Along a diffuse front, a broad area of low pressure in association with an upper-level low was noted several hundred miles northeast of Puerto Rico on June 8. After the circulation reformed within the area of stronger convection, the NHC estimated that Tropical Depression One developed at 18:00 UTC on June 11 about 535 mi (860 km) southeast of Bermuda. Initially, the system resembled a subtropical cyclone, due to its frontal characteristics. 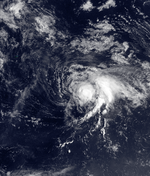 The nascent depression drifted northward for 24 hours, and during this time, it strengthened and was upgraded to Tropical Storm Arlene at 12:00 UTC on June 12, based on Dvorak satellite classifications. The storm intensified further to its peak intensity at 00:00 UTC on June 13, with estimated maximum sustained winds of 60 mph (95 km/h) and a minimum barometric pressure of 1,006 mbar (29.7 inHg), based on ship reports and satellite. Subsequently, weakening due to westerly wind shear, Arlene tracking westward on June 13 and turned northwest the following day. Because the steering current became poorly defined, it drifted starting on June 15, and executed a small cyclonic loop later that day. At 00:00 UTC on June 17, Arlene was downgraded to a tropical depression. Later that day, it passed about 115 mi (185 km) east of Bermuda, where gale-force winds and abnormally high tides were observed. The depression weakened further due to decreasing sea surface temperatures and dissipated early on June 18. A tropical wave crossed the west coast of Africa on June 20. As the wave moved into the western Caribbean Sea on June 30, a broad cyclonic turning was noted. The system moved over the Yucatán Peninsula on July 1, a day before emerging into the Bay of Campeche as a weak low pressure area. Later on July 2, deep convection became more organized while the system was centered over the southwestern Gulf of Mexico. By 18:00 UTC, the low developed into Tropical Depression Two. 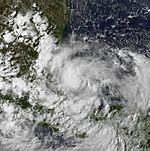 Around 04:00 UTC on July 3, the depression made landfall about 40 mi (65 km) south-southeast of Tuxpan, Veracruz, with winds of 35 mph (55 km/h). Eight hours later, it dissipated over the mountains of Mexico. The depression dropped heavy rain on the area amounting to a maximum of 20.37 in (517 mm) at Tanzabaca, San Luis Potosí. In some areas, up to 12.49 in (317 mm) of precipitation fell in 24 hours. 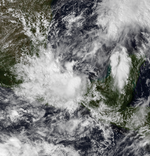 Late on August 18, a tropical wave in the Bay of Campeche spawned Tropical Depression Three. The depression drifted and was initially hampered by wind shear. By late on August 19, the depression was upgraded to Tropical Storm Bret amid more favorable atmosphere conditions. Bret then moved generally northward and strengthened into a hurricane early on August 21. Bret strengthened significantly over the next 36 hours, peaking as a 145 mph (230 km/h) Category 4 hurricane with a minimum barometric pressure of 944 mbar (27.9 inHg) on August 22. Thereafter, the storm began to weaken while curving west-northwestward. 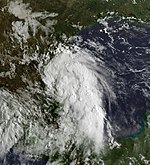 At 00:00 UTC on August 23, Bret made landfall in central Padre Island, Texas, as a Category 3 hurricane with winds of 115 mph (185 km/h). After moving inland, the storm weakened quickly, falling to tropical depression status on August 24. Early the following day, Bret dissipated near the border of Coahuila and Chihuahua. 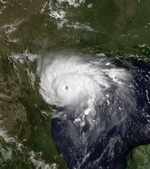 Bret was a small tropical cyclone that made landfall in a sparsely–populated region of Texas, resulting in relatively little damage. Heavy rainfall in the area peaked at 13.18 in (335 mm) in Sarita. At least 200 homes and large agricultural fields were flooded in Duval County. Strong winds left approximately 64,000 people without electricity in South Texas. Four people died after a truck and a tractor collided near Laredo due to slick roads. In Mexico, the storm brought flooding to Coahuila, Nuevo Leon, and Tamaulipas, with an estimated 14 in (360 mm) of rain falling in Nuevo Leon. Numerous homes in the affected regions were damaged or destroyed, leaving roughly 150 people homeless. Three people died in Mexico – one was trampled to death during evacuation, another was electrocuted, and the third drowned. Overall, the storm caused $15 million in damage. On August 18, a tropical wave moved westward off the coast of Africa. With low pressures and gradually organizing convection, Tropical Depression Four developed west of Senegal early on August 19. Initially it failed to intensify due to wind shear, and the center became ill-defined on August 20. After passing south of Cape Verde, the depression intensified into Tropical Storm Cindy as the convection became concentrated around the center. Due to a strong ridge, Cindy moved westward, before turning northwestward by August 21. Banding features gradually increased as outflow improved, and late on August 21, Cindy became a hurricane. Afterward, increased wind shear dislocated the convection from the center, which weakened Cindy to a tropical storm. By August 23, high wind shear remained, and the storm's winds decreased to 60 mph (100 km/h). The shear decreased on August 24, and the convection increased over the center. By late on August 25, Cindy regained hurricane status. A ragged eye appeared on satellite imagery on August 27, and early the next day it attained major hurricane status. Cindy turned north-northwestward, now showing a well-defined eye, and reached Category 4 intensity with winds of 140 mph (220 km/h) on August 28. Turning northward, the storm remained at peak intensity until August 30, when prominent wind shear weakened Cindy again. On August 31, Cindy was downgraded to a tropical storm, and later that day it merged with a large extratropical storm northwest of the Azores. Tropical Depression Five developed from a tropical wave about 220 mi (355 km) east of the Turks Islands on August 23. On the following day, the depression strengthened into Tropical Storm Dennis despite unfavorable westerly shear, which became a hurricane by August 26. After striking the Abaco Islands in the Bahama, conditions improved, allowing for Dennis to strengthen into a Category 2 by August 28. Around this time, Dennis began to move parallel to the Southeastern United States. Early on August 30, the storm peaked with maximum sustained winds of 105 mph (165 km/h) and a minimum barometric pressure of 962 mbar (28.4 inHg). By the following day, steering currents collapsed and the storm interacted with a cold front, causing Dennis to move erratically offshore North Carolina. Wind shear and cold air associated with the front weakened Dennis to a tropical storm on September 1 and removed some of its tropical characteristics. Eventually, warmer ocean temperatures caused some re-strengthening. By September 4, Dennis turned northwestward and made landfall in Cape Lookout, North Carolina, as a strong tropical storm. The storm slowly weakened inland, before transitioning into an extratropical cyclone over western New York on September 7. In the Bahamas, Dennis produced moderate winds, rain, and storm surge on San Salvador, Crooked Island, Eleuthera, and Abaco Islands, resulting in damage to roofs and coastal properties. Dennis brought 6–8 ft (1.8–2.4 m) waves to the east coast of Florida, causing minor erosion and four drowning deaths. The waves left severe erosion and coastal flooding along the Outer Banks of North Carolina. An 8 ft (2.4 m) deep channel created along Highway 12 isolated three towns on Hatteras Island. In Carteret, Craven, and Dare counties, the storm damaged at least 2,025 homes and businesses to some degree. Heavy rainfall, peaking at 19.91 in (506 mm) at Ocracoke, fell in eastern North Carolina. Although the precipitation was generally beneficial due to drought conditions, it also damaged crops. Two indirect deaths occurred in Richlands during a weather-related car accident. Similar inland flooding occurred in northern and eastern Virginia, with precipitation reaching 10.21 in (259 mm) near Lawrenceville. A tornado in Hampton severely damaged five apartment complexes, three of which were condemned completely, as well an assisted living facility; about 460 people were forced to evacuate from the buildings, and as many as 800 vehicles may have been damaged. Overall damage in North Carolina and Virginia totaled about $157 million. Generally minor flooding occurred in the Mid-Atlantic and New England. A tropical wave ahead of Hurricane Cindy exited the west coast of Africa on August 15. Minimal development occurred initially, although the structure gradually organized as it approached the Windward Islands. By 06:00 UTC on August 24, the NHC estimated that a tropical depression developed about 470 mi (760 km) east-northeast of Tobago. The depression strengthened into Tropical Storm Emily six hours later. At 1800 UTC on August 24, Emily attained its peak intensity with maximum sustained winds of 50 mph (85 km/h) and a minimum barometric pressure of 1,004 mbar (29.6 inHg). The NHC did not initiate advisories until 2100 UTC, when a reconnaissance aircraft observed winds of 63 mph (101 km/h) in association with the small circulation of Emily. The agency initially predicted that the storm would intensify into a hurricane near the Windward Islands. Increased wind shear generated by Hurricane Cindy caused Emily to weaken slightly on August 25. Emily began moving slowly northwestward and progressively became more influenced by Cindy, developing occasional convective bursts. Later on August 26, the movement turned northward, well offshore the Lesser Antilles. Eventually, the storm no longer produced convective bursts, and by 12:00 UTC on August 28, Emily weakened to a tropical depression. Six hours later, the storm was absorbed into Cindy northeast of the Leeward Islands. 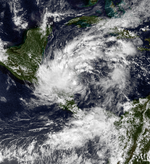 Interaction between a strong monsoon-type flow and a tropical wave in the Bay of Campeche resulted in the development of Tropical Depression Seven on September 5. By 00:00 UTC on September 6, the depression attained maximum sustained winds of 35 mph (55 km/h) and a minimum barometric pressure of 1,006 mbar (29.7 inHg). Shortly thereafter, the center of circulation of the depression became difficult to locate, but was likely heading north-northwestward. Due to warm ocean temperatures, the SHIPS model predicted further intensification, despite the storm having almost no deep convection and being close to land. At 12:00 UTC on September 6, the depression made landfall near La Pesca, Tamaulipas, with winds of 35 mph (55 km/h). The depression quickly weakened inland, and dissipated about twenty-four hours after landfall. Due to forecasts that the depression would strengthen to a tropical storm, the government of Mexico issued a tropical storm warning for Tampico to Matamoros, Tamaulipas. The storm caused heavy rainfall in Mexico, with as much as 17.43 in (443 mm) falling in Ciudad Mante in the state of Tamaulipas. In Texas, the depression produced light rainfall, peaking at 3.35 in (85 mm) in Harlingen. 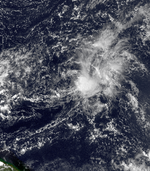 A westward moving tropical wave developed into a tropical depression while located about 1,000 mi (1,600 km) east of the Lesser Antilles on September 7. The depression strengthened and was upgraded to Tropical Storm Floyd on the following day. Floyd became a hurricane on September 10, while curving northwestward, before the storm resumed its initial west-northwestward course late on the following day. Significant intensification occurred on September 12 and September 13. At 12:00 UTC on the latter date, Floyd peaked with maximum sustained winds of 155 mph (250 km/h) and a minimum barometric pressure of 921 mbar (27.2 inHg). Thereafter, the storm began weakening while approaching the Bahamas, decreasing to Category 3 intensity at 06:00 UTC on September 14. Six hours later, Floyd made landfall near Alice Town on Eleuthera with winds of 120 mph (195 km/h), around the time that the cyclone began moving north-northwestward. Shortly before striking the Abaco Islands at 19:00 UTC, the hurricane re-intensified into a Category 4 hurricane. Early on September 15, Floyd weakened to a Category 3 hurricane and passed 110 mi (180 km) offshore Florida. Floyd weakened to a Category 2 hurricane late on September 15, while re-curving to the north-northeast. At 16:30 UTC on September 16, Floyd made landfall near Cape Fear, North Carolina, with winds of 105 mph (170 km/h). Thereafter, the storm rapidly weakened and was a tropical storm by early on the following day. Floyd moved along the coasts of the Delmarva Peninsula and New Jersey, before striking Long Island in New York early on September 17. Shortly thereafter, Floyd transitioned into an extratropical cyclone while interacting with a frontal zone over Maine. In the Bahamas, a combination of strong winds and storm surge destroyed numerous restaurants, hotels, shops, and homes, and left tens of thousands without water, electricity, and food. One death was reported. Although millions of people in Florida evacuated, damage was relatively minor. The outer bands of Floyd produced up to 3.2 in (81 mm) of rain and tropical storm force winds. As a result, hundreds of trees were downed, which damaged at 467 houses, and several hotels and businesses. Impact in Georgia and South Carolina was minor. North Carolina bore the brunt of the storm. Heavy precipitation fell in the eastern portion of the state, peaking at 24.06 in (611 mm) near Southport. Numerous rivers experienced at least 500-year floods, causing extensive flooding. About 7,000 homes were destroyed and an additional 56,000 suffered damage, of which 17,000 houses were left uninhabitable. At the height of the storm, more than 500,000 people lacked electricity. Thirty-five fatalities and about $4 billion in damage occurred in North Carolina. Flooding in Virginia damaged about 182 businesses and 9,250 houses, and left about 12 ft (3.7 m) of standing water in Franklin. There were three deaths and $101 million in losses. In Maryland, flooding damaged at least 694 homes, impacted numerous bridges and roads, and left over 250,000 residents without power. Similar effects occurred in Delaware, with at least 171 houses damaged and numerous roads being inundated or washed out. In Pennsylvania, flash flooding affected over 10,000 homes and left more than 500,000 people without electricity. Losses reached $60 million and there were 13 deaths in the state. The storm also caused significant impact in New Jersey, where 3,978 homes, 1,358 apartments, and 1,758 businesses were destroyed or suffer major damage. Six deaths occurred in the state. New York, New England, and Atlantic Canada also experienced flooding, but to a much lesser degree. Overall, Floyd caused about $6.5 billion in damage and 73 fatalities. On September 10, a tropical wave moved off the coast of Africa. Due to the development of a low-level circulation and convective banding, the wave became a tropical depression at 12:00 UTC on September 11 to the south of the Cape Verde islands. After increases in intensity, banding features, and outflow improvement, the depression was upgraded to Tropical Storm Gert on September 12 while moving west-northwestward to the south of a subtropical ridge. Warm ocean temperatures and an anticyclone aloft allowed Gert to reach hurricane intensity by the following day. Early on September 15, Gert attained major hurricane strength. After reaching Category 4 status that day, Gert strengthened further, peaking with maximum sustained winds of 150 mph (240 km/h) and a minimum barometric pressure of 930 mbar (27 inHg) on September 16. An eyewall replacement cyclone, as well as increasing wind shear and an upper-level trough restricting outflow later on, Gert weakened to a low-end Category 3 on September 18. Gert re-strengthened to a Category 4 hurricane on September 19. However, dry air and colder sea surface temperatures began causing the storm to weaken, with Gert falling to a Category 3 hurricane on September 20 and a Category 2 hurricane on September 21. That day, the hurricane passed about 135 mi (215 km) east of Bermuda. Accelerating northeastward under the influence of an approaching trough, Gert weakened to a tropical storm on September 23 after convection decreased around the center. By 12:00 UTC on September 23, convection diminished enough that the storm transitioned into an extratropical cyclone while situated about 55 mi (90 km) southeast of Cape Race, Newfoundland. About six hours later, the remnants of Gert were absorbed by a larger extratropical storm. For several days, Gert threatened to strike Bermuda, prompting the evacuation of tourists. Although Gert's center did not make landfall, it passed a short distance east of the island, producing hurricane-force winds that left 11,000 people without power. High waves swept two people out to sea at Acadia National Park in Maine. Later, strong waves struck Newfoundland and left heavy marine damage, with about $1.9 million in damage done to a wharf along the Avalon Peninsula. A tropical wave that emerged into the Atlantic from the west coast of Africa on September 4 reached the Gulf of Mexico by September 18. Following an increase in convection, the system became a tropical depression at 06:00 UTC on September 19. The depression initially tracked due northward and strengthened into Tropical Storm Harvey by early on September 20. Harvey gradually intensified further and 24 hours after the upgrade, the storm peaked with winds of 60 mph (95 km/h) and a minimum barometric pressure of 995 mbar (29.4 inHg). Thereafter, no significant change in intensity occurred before the storm made landfall in Everglades City, Florida, late on September 21. Harvey then accelerated across Florida and by early on September 22, merged with a developing extratropical low while located near Grand Bahama. The remnants reached Atlantic Canada before dissipating on September 24. In Florida, precipitation peaked at 10.24 in (260 mm) in Naples. As a result, at least 34 houses and businesses were flooded. There were sporadic reports of tropical storm-force winds throughout the state, as well as two tornadoes, neither of which caused left severe impact. Damage estimates in Florida reached about $15 million. Throughout the rest of the United States, impact was limited, confined to light rainfall in Georgia, North Carolina, and South Carolina. Heavy precipitation was reported in Atlantic Canada, with 11.89 in (302 mm) of rain falling in Oxford, Nova Scotia, making Harvey the wettest tropical cyclone or remnants on record in that country. Significant flooding, especially to roads and houses, was reported throughout Atlantic Canada, with damage totaling at least $7.6 million. Until a westward moving tropical wave reached the western Caribbean Sea on September 30, minimal organization occurred. The system eventually emerged into the Gulf of Mexico and developed into Tropical Depression Eleven on October 4. Weak steering current caused the depression to drift slowly and erratically, with the depression initially heading southward, before curving northwest. A surface trough over the central and eastern Gulf of Mexico prevented significant strengthening. The depression remained below tropical storm intensity, attaining its peak intensity on October 5, with maximum sustained winds of 35 mph (55 km/h) and a minimum barometric pressure of 1,002 mbar (29.6 inHg). While approaching the Gulf Coast of Mexico, the depression was absorbed by the surface trough at 18:00 UTC on October 6. The depression and its remnants contributed significantly to an ongoing flood in Mexico, bring up to 43.23 in (1,098 mm) of rain to Jalacingo, Veracruz. Throughout Mexico, 90,000 houses were damaged or destroyed, leaving about 500,000 people homeless. Flooding caused thousands of landslides and 39 rivers to overflow, leading to the destruction of bridges, houses, widespread crop fields, schools, and electrical networks. Flooding also extended into Central America in late September through early October, causing $40 million (385 million pesos) in crop damage and 70 deaths. However, impact by the depression itself cannot be distinguished. On September 30, a tropical wave emerged into the Atlantic Ocean from the west coast of Africa. It slowly began to organize during the next several days and by early on October 6, developed into Tropical Depression Twelve while located about 1,075 mi (1,730 km) east of Martinique. Due to an anticyclone, conditions appeared favorable for significant strengthening, with the National Hurricane Center predicting the depression to be at least a strong tropical storm by October 9. However, wind shear began undercutting the anticyclone, which prevented any significant intensification. Later on October 6, the low-level circulation became exposed to the west of the deep convection. The depression never re-organized and instead deteriorated in structure due to shearing. Despite a burst in convection on October 8, the depression dissipated at 18:00 UTC while located about 875 mi (1,410 km) east-northeast of Barbuda. A broad trough of low pressure developed into a tropical depression while south of the Isle of Youth on October 12. It headed north and soon intensified into Tropical Storm Irene. On October 14, the storm passed over the Isle of Youth and western Cuba. While over the Straits of Florida, Irene reached hurricane strength. The next day, it made landfall in Key West, Florida, and again near Cape Sable. Later on October 15, Irene moved back over water near Jupiter as a minimal hurricane. It slowly strengthened as it paralleled the East Coast of the United States. When Irene interacted with a trough from the west, while over the warm Gulf Stream waters, the hurricane rapidly intensified and attained its peak intensity with maximum sustained winds 110 mph (180 km/h) and a minimum barometric pressure of 960 mbar (28 inHg) on October 18. However, after accelerating northeast, Irene weakened over the cooler waters of the North Atlantic. On October 19, the hurricane transitioned into an extratropical cyclone near Newfoundland and was absorbed by an extratropical low shortly thereafter. Irene dropped heavy rainfall throughout its path, especially in Cuba and Florida. Rainfall on Cuba peaked at 35.6 in (905 mm) in Manaca-Iznaga, while the rest of the island reported more than 7 in (178 mm). Flooding resulted from the heavy rains, damaging more than 27,000 homes and causing significant effects to banana plantations and sugar cane fields. Hurricane forces winds were also reported in Havana. Four fatalities were reported. The storm brought flooding to Florida, particularly the southern portion of the state, where 17.45 in (443 mm) of rain fell in Boynton Beach. Hundreds were displaced from their homes and thousands were isolated. Five people died from walking through electrified water after a power line fell, while three others drowned after unintentionally driving their vehicle into a canal. Total damage in Florida was around $800 million. The hurricane left five deaths in the Bahamas, one direct and four indirect. Irene also contributed slightly to ongoing flood problems in North Carolina in the aftermath of Hurricane Floyd. A tropical wave entered the Atlantic on October 8 and developed into a tropical depression while located 700 mi (1,100 km) east of the Windward Islands on October 17. The depression strengthened and by early on October 18, it was upgraded to Tropical Storm Jose. Intensification continued as Jose tracked west-northwestward and Jose reached hurricane status late on October 19. The storm became a Category 2 hurricane, though unfavorable conditions weakened it back. Later on October 21, Jose began moving through the Lesser Antilles as a Category 1 and fell to tropical storm intensity before reentering the Atlantic later that day. While north of Puerto Rico on October 22, Jose re-curved northeastward. The storm eventually began to accelerate and re-strengthen, reaching hurricane status again on October 24. After twelve hours as a hurricane, colder sea surface temperatures weakened Jose to a tropical storm on October 25, shortly before it became extratropical. The worst of the effects from Jose occurred in Antigua and Barbuda, as winds up to 102 mph (164 km/h) were reported. About 500 houses and a newly built church were destroyed. About 50% of residents were left without water and 90% of people experienced power outages. Overall, twelve people were injured, one fatality occurred, and an elderly blind man was listed as missing. Flooding in Saint Kitts and Nevis washed out several major roads and caused landslides. Additionally, one person was killed during the storm. In Sint Maarten, mudslides and flooding damaged houses and roads, especially those in low-lying areas. Nearly 15 in (380 mm) of rain and winds up to 100 mph (160 km/h) in Anguilla left roads impassable and power outages, and damaged houses, crops, and shipping facilities. Strong winds and heavy rainfall in Puerto Rico and the United States Virgin Islands caused extensive power outages and minor damage, estimated at $40,000. Overall, losses from the storm was less than $5 million. A broad area of low pressure associated with remnants of a cold front developed into Tropical Depression Fifteen in the southwestern Caribbean Sea on October 28. Twenty-four hours later, it strengthened into Tropical Storm Katrina. The storm made near landfall Puerto Cabezas, Nicaragua, on October 30. Later that day, Katrina weakened back to a tropical depression. It continued northwestward across Nicaragua and Honduras, before reemerging into the Caribbean Sea off the coast of Honduras on October 31. However, Katrina did not re-intensify and moved inland over the Yucatán Peninsula later that day. 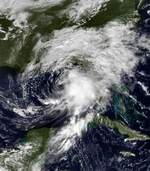 While approaching the Gulf of Mexico, Katrina was absorbed by a cold front on November 1. Katrina dropped heavy rainfall across, which was reported between 10 and 15 in (250 to 375 mm) throughout Nicaragua and Honduras. As a result of the flooding, roughly 1,200 people were evacuated to emergency shelters in Honduras. Flooding also damage five bridges in Honduras, and the cities of Tocoa and Trujillo were isolated as the Aguán and Siline rivers overflowed their banks. Katrina also destroyed water pipes that were replaced shortly after destruction from Hurricane Mitch. Shortly before dissipating, Katrina dropped moderate rainfall across the Yucatán Peninsula and eastern Mexico, peaking at 6.32 in (161 mm) in Cunduacán. Six years later, the name Katrina was used again in 2005 for a hurricane that devastated the Gulf Coast of the United States, particularly coastal Louisiana and Mississippi. A low pressure area developed into a tropical depression about 175 mi (280 km) south of the Cayman Islands at 18:00 UTC on November 13. The depression began to move in an unusual eastward track across the Caribbean Sea along the southern periphery of a trough and strengthened into Tropical Storm Lenny on the following day. It attained hurricane status south of Jamaica on November 15 and passed south of Hispaniola and Puerto Rico over the next few days. Beginning on November 16, Lenny underwent rapid deepening, becoming a major hurricane early on November 17 while south of the Mona Passage. Later that day, Lenny peaked as a Category 4 hurricane with winds of 155 mph (250 km/h) and a minimum pressure of 933 mbar (27.6 inHg) while near Saint Croix. It gradually weakened due to wind shear while moving through the Leeward Islands, where it struck Saint Martin, Anguilla, and Saint Barthélemy. The system weakened to a tropical storm on November 19. After clearing the islands, Lenny deteriorated to a tropical depression on November 21 and dissipated on November 23, while located about 690 mi (1,110 km) east of the Lesser Antilles. Before moving through the Lesser Antilles, Lenny produced rough surf that killed two people in northern Colombia. Strong winds and rainfall resulted in heavy crop damage in southeastern Puerto Rico. Lenny brought more heavy rains to areas in the Leeward Islands that had been affected by Hurricane Jose just one month earlier, and brought more damage to areas struck by Hurricane Georges in 1998. Despite the hurricane's passage near Saint Croix at peak intensity, damage on the small island was only described as "moderate", although there was widespread flooding and erosion. Damage in the United States territories totaled about $330 million. The highest precipitation total was 34.12 in (867 mm) at the police station on the French side of Saint Martin. On the island, the hurricane killed three people and destroyed more than 200 properties. In nearby Antigua and Barbuda, the hurricane killed one person; torrential rainfall there contaminated the local water supply. Significant storm damage occurred as far south as Grenada, where high surf isolated towns from the capital city. The following names were used during the 1999 Atlantic hurricane season in North Atlantic for systems that reached at least tropical storm intensity. It is the same list used for the 1993 season. A storm was named Lenny for the first (and only) time in 1999. The World Meteorological Organization retired the names Floyd and Lenny in the spring of 2000 and replaced them with Franklin and Lee for use in the 2005 season. All of the remaining names were re-used in the 2005 season. Names that were not assigned are marked in gray. This is a table of the storms in 1999 and their landfall(s), if any. Deaths in parentheses are additional and indirect (an example of an indirect death would be a traffic accident), but are still storm-related. Damage and deaths include totals while the storm was extratropical or a wave or low. ^ a b c "Background Information: The North Atlantic Hurricane Season". Climate Prediction Center. College Park, Maryland: National Oceanic and Atmospheric Administration. August 9, 2012. Retrieved April 11, 2013. ^ a b Summary of 1999 Atlantic Tropical Cyclone Season and Verification of Authors’ Seasonal Forecasts (PDF) (Report). London, England: Tropical Storm Risk. December 7, 1999. p. 3. Retrieved September 8, 2016. ^ William M. Gray; Christopher W. Landsea; Paul W. Mielke, Jr.; Kenneth J. Berry (December 4, 1998). "Extended Range Forecast of Atlantic Seasonal Hurricane Activity and U.S. Landfall Strike Probability for 1999". Fort Collins, Colorado: Colorado State University. Archived from the original (PDF) on September 10, 2003. Retrieved September 9, 2016. ^ William M. Gray; Christopher W. Landsea; Paul W. Mielke, Jr.; Kenneth J. Berry (April 7, 1999). "Early April Forecast of Atlantic Seasonal Hurricane Activity and U.S. Landfall Strike Probability for 1999" (PDF). Fort Collins, Colorado: Colorado State University. Retrieved September 9, 2016. ^ a b c "June–November Atlantic Hurricane Outlook". Climate Prediction Center. Camp Springs, Maryland: National Oceanic and Atmospheric Administration. May 27, 1999. Retrieved April 2, 2016. ^ a b c James L. Franklin (July 7, 1999). Preliminary Report: Tropical Storm Arlene (PDF). National Hurricane Center (Report). Miami, Florida: National Oceanic and Atmospheric Administration. Retrieved March 10, 2015. ^ a b c Miles B. Lawrence; Lixion A. Avila; Jack L. Beven; James L. Franklin; John L. Guiney; Richard J. Pasch (December 2001). Atlantic Hurricane Season of 1999 (PDF). Atlantic Oceanographic and Meteorological Laboratory (Report). Miami, Florida: National Oceanic and Atmospheric Administration. Retrieved April 5, 2016. ^ a b c Jack L. Beven (January 20, 2000). Brief Information about Tropical Depression Two (PDF). National Hurricane Center (Report). Miami, Florida: National Oceanic and Atmospheric Administration. Retrieved March 10, 2015. ^ a b c Lixion A. Avila (October 17, 1999). Preliminary Report: Tropical Depression Seven (PDF). National Hurricane Center (Report). Miami, Florida: National Oceanic and Atmospheric Administration. Retrieved March 13, 2015. ^ a b c d James L. Franklin (November 9, 1999). Preliminary Report: Tropical Depression Twelve (PDF). National Hurricane Center (Report). Miami, Florida: National Oceanic and Atmospheric Administration. Retrieved July 20, 2015. ^ "Atlantic Hurricane 1999 Season Summary". Silver Spring, Maryland: National Oceanic and Atmospheric Administration. May 10, 2000. Retrieved April 5, 2016. ^ a b John L. Beven II; Lixion A. Avila; Eric S. Blake; Daniel P. Brown; James L. Franklin; Richard D. Knabb; Richard J. Pasch; Jamie R. Rhome; Stacy R. Stewart (March 2008). Atlantic Hurricane Season of 2005 (PDF). Atlantic Oceanographic and Meteorological Laboratory (Report). Miami, Florida: National Oceanic and Atmospheric Administration. Archived from the original (PDF) on September 10, 2008. Retrieved April 5, 2016. ^ a b c d e f g John L. Guiney (February 22, 2000). Preliminary Report: Hurricane Lenny (PDF). National Hurricane Center (Report). Miami, Florida: National Oceanic and Atmospheric Administration. Retrieved July 20, 2015. ^ Cold and Warm Episode by Season. Climate Prediction Center (Report). College Park, Maryland: National Oceanic and Atmospheric Administration. July 6, 2015. Retrieved July 20, 2015. ^ Regional Climate Highlights - North America. Climate Prediction Center (Report). National Oceanic and Atmospheric Administration. May 11, 2000. Retrieved April 5, 2016. "Evacuan a 7 familias en Apodaca". El Norte (in Spanish). August 26, 1999. p. 16. Gary Padgett. Monthly Global Tropical Cyclone Summary August 1999 (Report). Retrieved March 10, 2015. Hurricane Bret (August 1999). National Weather Service in Houston-Galveston, Texas (Report). National Oceanic and Atmospheric Administration. June 20, 2008. Archived from the original on April 11, 2008. Retrieved June 12, 2009. Jack L. Beven (January 10, 2000). Preliminary Report: Hurricane Dennis (PDF). National Hurricane Center (Report). National Oceanic and Atmospheric Administration. Retrieved July 20, 2015. Eric S. Blake; Christopher W. Landsea; Ethan J. Gibney (August 10, 2011). The deadliest, costliest and most intense United States tropical cyclones from 1851 to 2010 (and other frequently requested hurricane facts) (PDF). National Climatic Data Center and National Hurricane Center (NOAA Technical Memorandum NWS NHC-6). National Oceanic and Atmospheric Administration. p. 47. Retrieved July 20, 2015. Climate-Watch, September 1999 (PDF). National Climatic Data Center (Report). National Oceanic and Atmospheric Administration. March 2, 2000. pp. 2–3. Retrieved July 20, 2015. Event Record Details: High Wind. National Climatic Data Center (Report). National Oceanic and Atmospheric Administration. Archived from the original on April 22, 2010. Retrieved April 22, 2010. Gert-1999 (Report). Environment Canada. September 14, 2010. Retrieved July 20, 2015. Miles B. Lawrence (July 22, 2000). Preliminary Report: Hurricane Gert (PDF). National Hurricane Center (Report). National Oceanic and Atmospheric Administration. Retrieved July 20, 2015. John L. Guiney (December 9, 1999). Preliminary Report: Tropical Storm Harvey (PDF). National Hurricane Center (Report). National Oceanic and Atmospheric Administration. Retrieved July 20, 2015. 1999-Harvey (Report). Environment Canada. Retrieved July 20, 2015. Mary Miranda (October 15, 1999). "Four Dead or Missing; Thousands Evacuated as a Result of Irene". Cuba Free Press. Retrieved July 20, 2015. Lixion A. Avila (November 12, 1999). Preliminary Report: Hurricane Irene (PDF). National Hurricane Center (Report). National Oceanic and Atmospheric Administration. Retrieved July 20, 2015. Event Record Details: Hurricane. National Climatic Data Center (Report). National Oceanic and Atmospheric Administration. Archived from the original on November 14, 2006. Retrieved April 22, 2010. John Zarrella; Jeff Flock (October 15, 1999). "Hurricane Irene pulls plug on 700,000 utility customers". CNN. Archived from the original on January 9, 2006. Retrieved 2006-06-28. Richard J. Pasch (December 22, 1999). Preliminary Report: Hurricane Jose (PDF). National Hurricane Center (Report). National Oceanic and Atmospheric Administration. Retrieved July 20, 2015. Caribbean Disaster Emergency Response Agency (October 21, 1999). Hurricane Jose Post Impact Situation Report #2 (Report). ReliefWeb. Retrieved January 10, 2013. Wendy Griffin (November 29, 1999). "Heavy rains wreck havoc on North Coast". Honduras This Week National. Tegucigalpa, Honduras. Archived from the original on March 17, 2013. Retrieved June 27, 2009. John L. Guiney (February 22, 2000). Preliminary Report: Hurricane Lenny (PDF). National Hurricane Center (Report). Miami, Florida: National Oceanic and Atmospheric Administration. Retrieved July 20, 2015. Eastern Caribbean: Hurricane Lenny Information Bulletin No. 3. International Federation of Red Cross and Red Crescent Societies (Report). ReliefWeb. 1999-11-18. Retrieved July 20, 2015. Northeastern Caribbean Hurricane Lenny Fact Sheet #1, FY 2000. US Agency for International Development (Report). ReliefWeb. November 23, 1999. Retrieved July 20, 2015. ^ David Levinson (August 20, 2008). 2005 Atlantic Ocean Tropical Cyclones. National Climatic Data Center (Report). Asheville, North Carolina: National Hurricane Center. Retrieved May 9, 2013. ^ "Earthweek: A Diary of the Planet". The Daily Gazette. June 20, 1999. p. 29. Retrieved May 3, 2016. ^ a b c d e f Roth, David M. (October 18, 2017). "Tropical Cyclone Point Maxima". Tropical Cyclone Rainfall Data. United States Weather Prediction Center. Retrieved November 26, 2017. ^ a b c d Miles B. Lawrence; Todd B. Kimberlain (February 26, 2001). Preliminary Report: Hurricane Bret (PDF). National Hurricane Center (Report). Miami, Florida: National Oceanic and Atmospheric Administration. Retrieved March 10, 2015. ^ "Storm Data and Unusual Weather Phenomena with Late Reports and Corrections" (PDF). Storm Data and Unusual Weather Phenomena. Asheville, North Carolina: National Oceanic and Atmospheric Administration. 41 (8): 166. ISSN 0039-1972. Archived from the original (PDF) on March 10, 2015. Retrieved March 10, 2015. ^ Hurricane Bret Disaster Update (Report). Washington, D.C.: Federal Emergency Management Agency. August 24, 1999. Archived from the original on March 14, 2004. Retrieved March 10, 2015. ^ Gary Padgett. Monthly Global Tropical Cyclone Summary August 1999 (Report). Retrieved March 10, 2015. ^ Hurricane Bret (August 1999). National Weather Service in Houston-Galveston, Texas (Report). Houston, Texas: National Oceanic and Atmospheric Administration. June 20, 2008. Archived from the original on April 11, 2008. Retrieved June 12, 2009. ^ a b c d e f g John L. Guiney (December 9, 1999). Preliminary Report: Hurricane Cindy (PDF). National Hurricane Center (Report). Miami, Florida: National Oceanic and Atmospheric Administration. Retrieved March 13, 2015. ^ Brian R. Jarvinen (August 20, 1999). Tropical Depression Four Discussion Number 6 (TXT). National Hurricane Center (Report). Miami, Florida: National Oceanic and Atmospheric Administration. Retrieved July 14, 2011. ^ Brian R. Jarvinen (August 20, 1999). Tropical Depression Four Advisory Number 6 (TXT). National Hurricane Center (Report). Miami, Florida: National Oceanic and Atmospheric Administration. Retrieved July 14, 2011. ^ Jack L. Beven (August 20, 1999). Tropical Storm Cindy Discussion Number 8 (TXT). National Hurricane Center (Report). Miami, Florida: National Oceanic and Atmospheric Administration. Retrieved July 14, 2011. ^ Richard J. Pasch (August 21, 1999). Tropical Storm Cindy Discussion Number 10 (TXT). National Hurricane Center (Report). Miami, Florida: National Oceanic and Atmospheric Administration. Retrieved July 14, 2011. ^ B. Max Mayfield (August 21, 1999). Tropical Storm Cindy Discussion Number 11 (TXT). National Hurricane Center (Report). Miami, Florida: National Oceanic and Atmospheric Administration. Retrieved July 14, 2011. ^ Brian R. Jarvinen (August 22, 1999). Hurricane Cindy Advisory Number 13 (TXT). National Hurricane Center (Report). Miami, Florida: National Oceanic and Atmospheric Administration. Retrieved July 14, 2011. ^ Brian R. Jarvinen (August 22, 1999). Hurricane Cindy Discussion Number 14 (TXT). National Hurricane Center (Report). Miami, Florida: National Oceanic and Atmospheric Administration. Retrieved July 14, 2011. ^ Lixion A. Avila (August 22, 1999). Tropical Storm Cindy Discussion Number 16 (TXT). National Hurricane Center (Report). Miami, Florida: National Oceanic and Atmospheric Administration. Retrieved July 14, 2011. ^ James L. Franklin (August 23, 1999). Tropical Storm Cindy Discussion Number 17 (TXT). National Hurricane Center (Report). Miami, Florida: National Oceanic and Atmospheric Administration. Retrieved July 14, 2011. ^ B. Max Mayfield (August 25, 1999). Tropical Storm Cindy Discussion Number 25 (TXT). National Hurricane Center (Report). Miami, Florida: National Oceanic and Atmospheric Administration. Retrieved July 14, 2011. ^ James L. Franklin (August 27, 1999). Hurricane Cindy Discussion Number 35 (TXT). National Hurricane Center (Report). Miami, Florida: National Oceanic and Atmospheric Administration. Retrieved July 14, 2011. ^ Brian R. Jarvinen (August 28, 1999). Hurricane Cindy Discussion Number 37 (TXT). National Hurricane Center (Report). Miami, Florida: National Oceanic and Atmospheric Administration. Retrieved July 14, 2011. ^ James L. Franklin (August 28, 1999). Hurricane Cindy Discussion Number 40 (TXT). National Hurricane Center (Report). Miami, Florida: National Oceanic and Atmospheric Administration. Retrieved July 14, 2011. ^ Brian R. Jarvinen (August 30, 1999). Tropical Storm Cindy Advisory Number 50 (TXT). National Hurricane Center (Report). Miami, Florida: National Oceanic and Atmospheric Administration. Retrieved July 14, 2011. ^ a b c d e Jack L. Beven (January 10, 2000). Preliminary Report: Hurricane Dennis (PDF). National Hurricane Center (Report). National Oceanic and Atmospheric Administration. Retrieved July 20, 2015. ^ "Tropical Cyclones which affected the Bahamas". The Bahamas Meteorological Department. Archived from the original on July 16, 2011. Retrieved July 21, 2015. ^ Estes Thompson (September 1, 1999). "Dennis Forcing Residents To Flee". The Columbian. Nags Head, North Carolina. Associated Press. Archived from the original on July 14, 2014. Retrieved March 11, 2016. ^ Elizabeth A. Davis (September 6, 1999). "Governor, officials view storm's damage firsthand". The Herald-Sun. Buxton, North Carolina. Associated Press. p. A1 – via NewsBank.com. ^ Allen G. Breed (August 29, 1999). "Hurricane Dennis heading out to sea". Arizona Daily Sun. Atlantic Beach, North Carolina. Associated Press. Retrieved March 11, 2016. ^ a b c d e "Storm Data and Unusual Weather Phenomena with Late Reports and Corrections" (PDF). National Climatic Data Center. Asheville, North Carolina: National Oceanic and Atmospheric Administration. 41 (9): 22–24, 28–29, 47, 49, 51–52, 55, 66, 68–70, 72–74, 99, 102–103, 108, 127–128. ISSN 0039-1972. Archived from the original (PDF) on March 11, 2016. Retrieved March 11, 2016. ^ a b Lixion A. Avila (September 30, 1999). Preliminary Report: Tropical Storm Emily (PDF). National Hurricane Center (Report). Miami, Florida: National Oceanic and Atmospheric Administration. Retrieved March 13, 2015. ^ Lixion A. Avila (August 24, 1999). Tropical Storm Emily Advisory Number 1 (TXT). National Hurricane Center (Report). Miami, Florida: National Oceanic and Atmospheric Administration. Retrieved May 10, 2016. ^ Miles B. Lawrence (September 5, 1999). Tropical Depression Seven Discussion Number 2 (TXT). National Hurricane Center (Report). Miami, Florida: National Oceanic and Atmospheric Administration. Retrieved July 14, 2011. ^ David M. Roth (May 1, 2009). Tropical Depression #7 - September 3-10, 1999. Weather Prediction Center (Report). College Park, Maryland: National Oceanic and Atmospheric Administration. Archived from the original on 25 July 2011. Retrieved March 13, 2015. ^ a b c d Richard J. Pasch; Todd B. Kimberlain; Stacy R. Stewart (September 9, 2014). Preliminary Report: Hurricane Floyd (PDF). National Hurricane Center (Report). Miami, Florida: National Oceanic and Atmospheric Administration. Retrieved July 20, 2015. ^ "Battered Bahamas start difficult clean-up in Floyd's wake". ReliefWeb. Agence France-Presse. September 16, 1999. Retrieved March 13, 2016. ^ Rick Graef (January 27, 2000). The Abacos' Hurricane Floyd Information Pages Relief and Rebuilding Reports and Updates (Report). Go-Abacos.Com. Archived from the original on May 12, 2001. Retrieved March 13, 2016. ^ a b c Climate-Watch, September 1999 (PDF). National Climatic Data Center (Report). National Oceanic and Atmospheric Administration. March 2, 2000. pp. 2–3. Archived from the original (PDF) on March 4, 2016. Retrieved July 20, 2015. ^ David M. Roth; Hugh Cobb (March 1, 2007). Late Twentieth Century Virginia Hurricanes. National Weather Service Office Wakefield, Virginia (Report). Camp Springs, Maryland: National Oceanic and Atmospheric Administration. Retrieved March 3, 2014. ^ 1999-Floyd (Report). Environment Canada. September 14, 2010. Retrieved April 2, 2016. ^ a b c d e f g h i j k l Miles B. Lawrence (July 22, 2000). Preliminary Report: Hurricane Gert (PDF). National Hurricane Center (Report). Miami, Florida: National Oceanic and Atmospheric Administration. Retrieved July 20, 2015. ^ Lixion A. Avila (September 12, 1999). Tropical Storm Gert Discussion 5. National Hurricane Center (Report). Miami, Florida: National Oceanic and Atmospheric Administration. Retrieved March 11, 2016. ^ Lixion A. Avila (September 12, 1999). Tropical Storm Gert Discussion 6. National Hurricane Center (Report). Miami, Florida: National Oceanic and Atmospheric Administration. Retrieved March 11, 2016. ^ Richard J. Pasch (September 13, 1999). Tropical Storm Gert Discussion 7. National Hurricane Center (Report). Miami, Florida: National Oceanic and Atmospheric Administration. Retrieved March 11, 2016. ^ Jack L. Beven (September 16, 1999). Hurricane Gert Discussion 20. National Hurricane Center (Report). Miami, Florida: National Oceanic and Atmospheric Administration. Retrieved March 11, 2016. ^ Richard J. Pasch (September 18, 1999). Hurricane Gert Discussion 27. National Hurricane Center (Report). Miami, Florida: National Oceanic and Atmospheric Administration. Retrieved March 11, 2016. ^ James L. Franklin (September 20, 1999). Hurricane Gert Discussion 36. National Hurricane Center (Report). Miami, Florida: National Oceanic and Atmospheric Administration. Retrieved March 11, 2016. ^ James L. Franklin (September 22, 1999). Hurricane Gert Discussion 44. National Hurricane Center (Report). Miami, Florida: National Oceanic and Atmospheric Administration. Retrieved March 11, 2016. ^ Richard J. Pasch (September 21, 1999). Hurricane Gert Discussion 42. National Hurricane Center (Report). Miami, Florida: National Oceanic and Atmospheric Administration. Retrieved March 11, 2016. ^ Richard J. Pasch (September 23, 1999). Tropical Storm Gert Discussion 49. National Hurricane Center (Report). Miami, Florida: National Oceanic and Atmospheric Administration. Retrieved March 11, 2016. ^ Raymond Hainey (September 22, 1999). "Hurricane Gert Takes Aim at Bermuda". Hamilton, Bermuda. Associated Press. Retrieved March 11, 2016. ^ "Hurricane Gert batters Bermuda". USA Today. September 22, 1999. ^ Gert-1999 (Report). Environment Canada. September 14, 2010. Retrieved March 11, 2016. ^ a b John L. Guiney (December 9, 1999). Preliminary Report: Tropical Storm Harvey (PDF). National Hurricane Center (Report). Miami, Florida: National Oceanic and Atmospheric Administration. Retrieved July 20, 2015. ^ a b 1999-Harvey (Report). Environment Canada. September 14, 2010. Retrieved March 10, 2016. ^ a b c John L. Beven (December 1, 1999). Preliminary Report: Tropical Depression Eleven (PDF). National Hurricane Center (Report). National Oceanic and Atmospheric Administration. Retrieved July 20, 2015. ^ David M. Roth (June 16, 2007). Tropical Depression #11 – September 30-October 9, 1999. Weather Prediction Center (Report). College Park, Maryland: National Oceanic and Atmospheric Administration. Retrieved July 14, 2011. ^ Government of Mexico (1999-10-18). Mexico: Overview of support given to flood victims (Report). ReliefWeb. Retrieved May 11, 2016. ^ Government of Mexico (October 18, 1999). Mexico: Reports on the measures implemented by the Federal Government to aid communities affected by rain (Report). ReliefWeb. Retrieved May 11, 2016. ^ María Teresa Váquez Conde; José Lugo; Lucía Guadalupe Matías (2001). "Heavy Rainfall Effects in Mexico During Early October 1999". In Gruntfest, Eve; Handmer, John. Coping with Flash Floods. The Netherlands: Kluwer Academic Publishers. pp. 289–296. Retrieved May 11, 2016. ^ Oxfam Emergency Briefing: Mexico Floods (Report). ReliefWeb. Oxfam. October 29, 1999. Retrieved May 11, 2016. ^ José Lugo-Hubp; José Juan Zamorano-Orozco; Lucia Capra; Moshe Inbar; Irasema Alcántara-Ayala (2005). "Los procesos de remoción en masa en la Sierra Norte de Puebla, octubre de 1999: Causa y efectos" (PDF). Revista Mexicana de Ciencias Geológicas (in Spanish). 22 (2). ^ Government of Mexico (October 13, 1999). Report on the advances made to offset the emergency caused by the rains (Report). ReliefWeb. Retrieved May 11, 2016. ^ SCF: Central America floods (Report). Save the Children. October 12, 1999. Retrieved May 11, 2016. ^ Lixion A. Avila (October 6, 1999). Tropical Depression Twelve Discussion Number 1 (TXT). National Hurricane Center (Report). Miami, Florida: National Oceanic and Atmospheric Administration. Retrieved July 7, 2012. ^ Jack L. Beven (October 6, 1999). Tropical Depression Twelve Discussion Number 3 (TXT). National Hurricane Center (Report). Miami, Florida: National Oceanic and Atmospheric Administration. Retrieved July 7, 2012. ^ Jack L. Beven (October 6, 1999). Tropical Depression Twelve Discussion Number 4 (TXT). National Hurricane Center (Report). Miami, Florida: National Oceanic and Atmospheric Administration. Retrieved July 7, 2012. ^ James L. Franklin (October 8, 1999). Tropical Depression Twelve Discussion Number 11 (TXT). National Hurricane Center (Report). Miami, Florida: National Oceanic and Atmospheric Administration. Retrieved December 18, 2012. ^ a b c d e Lixion A. Avila (November 12, 1999). Preliminary Report: Hurricane Irene (PDF). National Hurricane Center (Report). National Oceanic and Atmospheric Administration. Retrieved July 20, 2015. ^ Alejandro Bezanilla (January 2000). Cyclone Season of 1999 on the North Atlantic Ocean. SOMETCUBA Bulletin (Report). Cuban Meteorological Society. Archived from the original on 16 July 2011. Retrieved July 14, 2011. ^ "Cuba revela nuevas cifras de daños causados por huracán Irene". CubaNet News (in Spanish). 1999. Archived from the original on 16 June 2011. Retrieved July 14, 2011. ^ "Hurricane Irene lashes Cuba". BBC News. October 15, 1999. Retrieved July 14, 2011. ^ Mary Miranda (October 15, 1999). "Four Dead or Missing; Thousands Evacuated as a Result of Irene". Cuba Free Press. Retrieved July 14, 2011. ^ Abaco Journal on the World Wide Web (1999). The Year in Review (Report). Archived from the original on March 21, 2005. Retrieved June 28, 2006. ^ John Zarrella; Jeff Flock (October 15, 1999). "Hurricane Irene pulls plug on 700,000 utility customers". Cnn. Miami, Florida. Archived from the original on January 9, 2006. Retrieved June 28, 2006. ^ a b Richard J. Pasch (December 22, 1999). Preliminary Report: Hurricane Jose (PDF). National Hurricane Center (Report). Miami, Florida: National Oceanic and Atmospheric Administration. Retrieved July 20, 2015. ^ Lixion A. Avila (October 20, 1999). Hurricane Jose Tropical Cyclone Update (Report). Caribbean Hurricane Network. Retrieved March 13, 2015. ^ a b Margareta Wahlström; George Weber (November 3, 1999). Antigua and Barbuda: Hurricane Jose (PDF) (Report). International Federation of Red Cross and Red Crescent Societies. Retrieved March 13, 2015. ^ Historical Tropical Cyclone (Hurricane) Information for Anguilla from 1955-2000 (Report). World-Weather-Travellers-Guide.com. Retrieved March 13, 2015. ^ "Storm Data and Unusual Weather Phenomena with Late Reports and Corrections" (PDF). Storm Data and Unusual Weather Phenomena. Asheville, North Carolina: National Oceanic and Atmospheric Administration. 41 (10): 56 and 63. ISSN 0039-1972. Archived from the original (PDF) on March 13, 2015. Retrieved March 13, 2015. ^ Miles B. Lawrence (November 30, 1999). Preliminary Report: Tropical Storm Katrina (PDF). National Hurricane Center (Report). Miami, Florida: National Oceanic and Atmospheric Administration. Retrieved July 20, 2015. ^ Atlantic Hurricane 1999 Season Summary (Report). Silver Springs, Maryland: National Oceanic and Atmospheric Administration. May 10, 2000. Archived from the original on July 16, 2011. Retrieved July 14, 2011. ^ Honduras - Floods OCHA - Situation Report No. 7 (Report). Geneva, Switzerland: Office for the Coordination of Humanitarian Affairs. November 7, 1999. Retrieved March 2, 2013. ^ Wendy Griffin (November 29, 1999). "Heavy rains wreck havoc on North Coast". Honduras This Week National. Tegucigalpa, Honduras. Archived from the original on March 17, 2013. Retrieved June 27, 2009. ^ a b Preliminary Storm Report on Hurricane Lenny November 16–19, 1999. San Juan, Puerto Rico National Weather Service Office (Report). San Juan, Puerto Rico: National Oceanic and Atmospheric Administration. Retrieved July 20, 2015. 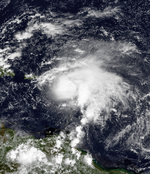 ^ Eastern Caribbean: Hurricane Lenny Information Bulletin No. 3. International Federation of Red Cross and Red Crescent Societies (Report). ReliefWeb. November 18, 1999. Retrieved July 20, 2015. ^ Northeastern Caribbean Hurricane Lenny Fact Sheet #1, FY 2000. US Agency for International Development (Report). ReliefWeb. November 23, 1999. Retrieved July 20, 2015. ^ Hurricane Lenny Recovery in the Eastern Caribbean (DOC) (Report). USAID. April 17, 2000. Retrieved July 20, 2015. ^ "1999 Hurricane Names". St. Petersburg Times. May 30, 1999. Retrieved April 5, 2016. ^ "Arlene...Bret...Cindy...Dennis...Tropical storms and..." Orlando Sentinel. August 26, 1993. Retrieved April 5, 2016. ^ "Tropical Cyclone Naming History and Retired Names". National Hurricane Center. 2015. Retrieved April 5, 2016. ^ Ed Payne (May 31, 2005). "'Very active' hurricane season forecast". CNN. Retrieved April 5, 2016. 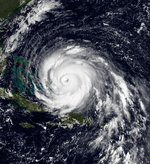 Wikimedia Commons has media related to 1999 Atlantic hurricane season.